This article is about the tree. For other uses, see Banyan (disambiguation). A banyan, also spelled "banian", is a fig that begins its life as an epiphyte, i.e. a plant that grows on another plant, when its seed germinates in a crack or crevice of a host tree or edifice. "Banyan" often specifically denominates Ficus benghalensis (the "Indian banyan"), which is the national tree of the Republic of India, though the name has also been generalized to denominate all figs that share a common life cycle and used systematically in taxonomy to denominate the subgenus Urostigma. Like other fig species, including the common edible fig Ficus carica, banyans bear multiple fruit in structures denominated "syncarps". The syncarp of Ficus species supplies shelter and food for fig wasps and, in turn, the trees are totally dependent on the fig wasps for pollination. The leaves of the banyan tree are large, leathery, glossy, green, and elliptical. Like most figs, the leaf bud is covered by two large scales. As the leaf develops the scales abscise. Young leaves have an attractive reddish tinge. Older banyan trees are characterized by aerial prop roots that mature into thick, woody trunks, which can become indistinguishable from the primary trunk with age. Old trees can spread laterally by using these prop roots to grow over a wide area. In some species, the prop roots develop over a considerable area that resembles a grove of trees, with every trunk connected directly or indirectly to the primary trunk. The topology of this massive root system inspired the name of the hierarchical computer network operating system "Banyan VINES". In a banyan that envelops its host tree, the mesh of roots growing around the latter eventually applies considerable pressure to and commonly kills it. Such an enveloped, dead tree eventually decomposes, so that the banyan becomes a "columnar tree" with a hollow, central core. In jungles, such hollows are very desirable shelters to many animals. Different parts of the tree are known to be helpful in treating diseases like dysentery, diarrhea, diabetes, leucorrhoea, menorrhagia and nervous disorders. Banyan trees have many different health benefits due to the many endophytes that they host in their aerial roots. These endophytes have a symbiotic relationship with the tree by providing the tree with protection from microbes, and the tree in return hosts the endophytes. These endophytes also help the tree by protecting them against pathogens and by helping their fitness by nitrogen fixation. In an experiment, these endophytes from the aerial roots of a banyan tree were examined to see how well they would be able to fight off certain bacteria strains that highly affect different plants. An ICMS approach was used to test the virulence of the endophytes against the bacteria. The results indicate that there is a broad spectrum of anti-fungal activity present in the tree's aerial roots that can be used as anti-fungal agents in other plants as well, after further development. The banyan tree is a versatile organism that is highly adapted to its environment. Its aerial roots help it survive in a warm and moist environment as well as provide the large tree with structural support. It also has adapted to having symbiotic relationships with many organisms spanning from endophytes to humans. For example, the tree hosts the endophytes and the endophytes provide it protection from pathogens and nutrients. The tree can provide humans shelter as well as many different health-related benefits like antioxidants from its bark. The name was originally given to F. benghalensis and comes from India, where early travellers observed that the shade of the tree was frequented by Banyans (a corruption of Baniyas, a community of Indian traders). In the Gujarati language, banya means "grocer or merchant", not "tree". The Portuguese picked up the word to refer specifically to Hindu merchants, and passed it along to the English as early as 1599 with the same meaning. By 1634, English writers began to tell of the banyan tree, a tree under which Hindu merchants conducted their business. The tree provided a shaded place for a village meeting or for merchants to sell their goods. Eventually, "banyan" became the name of the tree itself. Ficus microcarpa, which is native to Sri Lanka, China, India, Nepal, Bhutan, Taiwan, the Malay Archipelago, New Guinea, Australia, Ryukyu Islands and New Caledonia, is a significant invasive species elsewhere. The Central American banyan (Ficus pertusa) is native to Central America and northern South America, from southern Mexico south to Paraguay. The shortleaf fig (Ficus citrifolia) is native to southern Florida, the Caribbean Islands, Central America, and South America south to Paraguay. One theory is that the Portuguese name for F. citrofolia, os barbados, gave Barbados its name. The Florida strangler fig (Ficus aurea) is also native to southern Florida and the Caribbean Islands, and distinguished from the above by its coarser leaf venation. The Moreton Bay fig (Ficus macrophylla) and Port Jackson fig (Ficus rubiginosa) are other related species. Due to the complex structure of the roots and extensive branching, the banyan is used as a subject specimen in penjing and bonsai. The oldest, living bonsai in Taiwan is a 240-year-old banyan tree housed in Tainan. The banyan tree is the national tree of India. It is also called Indian or Bengal fig. This tree is considered sacred in India and can be seen near a temple or religious center. It is a big tree and gives shade to travelers in very hot summer months. An old custom offers worship to this tree. In Hinduism, the leaf of the banyan tree is said to be the resting place for the god Krishna. In the Bhagavat Gita, Krishna said, "There is a banyan tree which has its roots upward and its branches down, and the Vedic hymns are its leaves. One who knows this tree is the knower of the Vedas." (Bg 15.1) Here the material world is described as a tree whose roots are upwards and branches are below. We have experience of a tree whose roots are upward: if one stands on the bank of a river or any reservoir of water, he can see that the trees reflected in the water are upside down. The branches go downward and the roots upward. Similarly, this material world is a reflection of the spiritual world. The material world is but a shadow of reality. In the shadow there is no reality or substantiality, but from the shadow we can understand that there is substance and reality. The banyan tree is also considered sacred and is called vat vriksha (IAST vaṭa vṛkṣa, वट वृक्ष) in Sanskrit, in Telugu known as: మర్రి చెట్టు; marri chettu, in Kannada language known as: 'Alada mara' and in Tamil known as: 'ஆல மரம்' ; ala maram. The god Shiva as Dakshinamurthy is nearly always depicted sitting in silence under the banyan with rishis at his feet. It is thought of as perfectly symbolizing eternal life due to its seemingly unending expansion. In modern parlance in the Hindi language, it is known as bargad, vatavriksh, and barh. In Buddhism's Pali canon, the banyan (Pali: nigrodha) is referenced numerous times. Typical metaphors allude to the banyan's epiphytic nature, likening the banyan's supplanting of a host tree as comparable to the way sensual desire (kāma) overcomes humans. The Lam Tsuen Wishing Trees (林村許願樹) are banyan, and are a popular shrine in Hong Kong. They are located near the Tin Hau Temple in Lam Tsuen. In many stories of Philippine mythology, the banyan (locally known as balete or balite) is said to be home to a variety of spirits (diwata and engkanto) and demon-like creatures (among the Visayans, specifically, the dili ingon nato, meaning "those not like us"). Maligno (evil spirits, from Spanish for 'malign') associated with it include the kapre (a giant), duwende (dwarves), and the tikbalang (a creature whose top half is a horse and whose bottom half is human). [self-published source] Children at a young age are taught never to point at a fully mature banyan tree for fear of offending the spirits that dwell within them, most especially when they are new to the place. Filipinos always uttered a respectful word or two to the spirits in the banyan tree when they are near one, walking near or around it to avoid any harm. Nearly every Filipino believes that provoking the spirits in a banyan tree can cause one great harm, illness, misfortune, untold suffering, and death. In Guam, the Chamorro people believe in tales of taotaomona, duendes, and other spirits. Taotaomona are spirits of the ancient Chamorro that act as guardians to banyan trees. In Sabah, formerly North Borneo, Nunuk Ragang or Red Banyan is traditionally considered to be the site of the longhouses, sheltering the 10 families (immigrants from Taiwan or Southern China) who were the ancestors of the present-day kadazan-Dusun population of 555,647 (2010 census). Thimmamma Marrimanu is a banyan tree in Anantapur, located circa 35 km from the town of Kadiri in the state of Andhra Pradesh, India. It is present in the Indian Botanical Gardens and is more than 200 years old. It is reported to be the world's biggest tree with a canopy of 19,107 m2. Its branches spread over 8 acres, hence it was recorded as the biggest tree in the Guinness Book of World Records in 1989. One of the largest trees, the Great Banyan is found in Kolkata, India. It is said to be more than 250 years old. Another such tree, Dodda Aalada Mara as in "Big Banyan Tree", is found in the outskirts of Bangalore, India; it has a spread of circa 2.5 acres. One of the most famous banyan trees, Kabirvad was planted on an island in a river in Bharuch, Gujarat, India. Records show that Kabirvad is more than 300 years old. Another famous banyan tree was planted in Jaipur district of Rajasthan. Records show that it is more than 200 years old. The Iolani Palace banyans in Honolulu, Hawaii. In the 1880s Queen Kapiolani planted two banyan trees within the Iolani Palace grounds. These trees have since grown into large groupings of trees on the old historic palace grounds. Maui, Hawaii has a banyan tree planted by William Owen Smith in 1873 in Lahaina's Courthouse Square. It has grown to cover two-thirds of an acre. In rural parts of India, many villages and towns have a traffic circle and a community gathering place around a big banyan tree. At night, many people come to sit, relax, and chat around it. Usually, a small deity is placed and worshipped at its foot. Ta Prohm in the Angkor Wat temple complex in Cambodia boasts giant banyans growing around and through its walls. Several banyans grow near downtown Hilo, Hawaii, United States. Some of them were planted by celebrities in the 20th century and form Banyan Drive. Banyans occur in areas of Australia such as the Daintree Rainforest in Tropical North Queensland. Well known is the Curtain Fig Tree on the Atherton Tablelands. Thomas A. Edison planted the first banyan tree in the continental United States in Fort Myers, Florida, in an attempt with Henry Ford to find a more cost-effective way to produce rubber for car tires. The tree, originally only 4 feet (1.2 m) tall, now covers one acre of the estate. One large banyan tree, Kalpabata, is inside the premises of Jagannath Temple in Puri. It is considered sacred by the devotees and is supposed to be more than 500 years old. A large banyan tree lives in Cypress Gardens, at the Legoland theme park located in Winter Haven, Florida. It was planted in 1939 in a 5-gallon bucket. 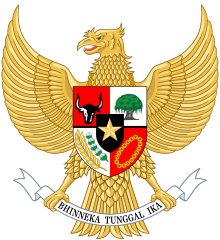 The banyan is part of the coat of arms of Indonesia. It is meant to symbolize the unity of Indonesia - one country with many far-flung roots. As a giant tree, it also symbolizes power. Soeharto used it as a logo for his party, the Golongan Karya (Golkar), taking advantage of the deeply rooted belief of his fellow-countrymen and women in the sacred (sakti) nature of the banyan. The Economist magazine features an opinion column covering topics pertaining to Asia named "Banyan". In southern Vanuatu, the clearings under banyan trees are used as traditional meeting places. The quarterly newsletter of the British Friends of Vanuatu Society is named Nabanga, after the local word for banyan. The Banyan Tree is a notoriously difficult room in the 1984 ZX Spectrum platform game Jet Set Willy. ^ "Banian". Dictionary.com. Random House. Retrieved 15 March 2016. ^ Laman, Timothy G. (1995). "The Ecology of Strangler Fig Seedling Establishment". Selbyana. 16 (2): 223–9. JSTOR 41759910. ^ "National Tree". Know India. Government of India. Archived from the original on 13 February 2016. Retrieved 16 January 2012. ^ Note the use of "Banyan" versus "banyan" in Athreya, Vidya R. (July 1997). "Nature Watch: Trees with a Difference: The Strangler Figs". Resonance. 2 (7): 67–74. doi:10.1007/BF02838593. ; also "Aerial-Rooting Banyan Trees". Natural History Guide To American Samoa. University of Washington. Archived from the original on 4 September 2007. ^ Zhou Zhekun; Gilbert, Michael G. (2003). "Moraceae" (PDF). In Zhengyi Wu; Raven, Peter H.; Deyuan Hong (eds.). Flora of China. Volume 5. pp. 21–73. ISBN 978-1-930723-27-6. Archived from the original (PDF) on 1 September 2006. ^ Serventy, Vincent (1984). Australian Native Plants. Frenchs Forest, NSW: Reed. ISBN 978-0-7301-0020-1. ^ "Light in the Rainforest" (PDF). Tropical Topics. Vol. 1 no. 5. Queensland Department of Environment and Heritage. 1992. p. 1. Archived from the original (PDF) on 29 May 2009. ^ "The Banyan Tree". The Lovely Plants. 14 September 2010. ^ P., Joshisree K.; G., Rajesh; R., Siddarama (2018-01-01). "Corticosteroids Induced Ecchymosis". International Journal of Pharmacy and Pharmaceutical Sciences. 10 (1): 211. doi:10.22159/ijpps.2018v10i1.22212. ISSN 0975-1491. ^ a b "Back cover". Chemical Communications. 53 (36): 5072. 2017. doi:10.1039/c7cc90165h. ISSN 1359-7345. ^ Shukla, Rimi; Gupta, Shweta; Gambhir, J.K; Prabhu, K.M; Murthy, P.S (2004-05-01). "Antioxidant effect of aqueous extract of the bark of Ficus bengalensis in hypercholesterolaemic rabbits". Journal of Ethnopharmacology. 92 (1): 47–51. doi:10.1016/j.jep.2004.01.020. ISSN 0378-8741. PMID 15099846. ^ Yule, Henry; Burnell, Arthur Coke (1903). Crooke, William (ed.). Hobson-Jobson: A glossary of colloquial Anglo-Indian words and phrases, and of kindred terms, etymological, historical, geographical and discursive (New ed.). London: J. Murray. p. 65. ^ "Small Is the Old Big". Taipei Times. 22 September 2005. ^ "Significance of Vat Savitri Puja". Hindu Blog. ^ Pali Text Society, London (1921–25). Rhys Davids, T. W.; Stede, William (eds.). The Pali Text Society's Pali-English dictionary. Chipstead. p. 355, entry "Nigrodha,". Retrieved 22 November 2008. ^ See, for instance, the automated search of the SLTP ed. of the Pali Canon for the root "nigrodh" which results in 243 matches "Search term 'Nigrodh' found in 243 pages in all documents". Bodhgayanews.net. Archived from the original on 2 December 2008. Retrieved 22 November 2008. ^ See, e.g., SN 46.39, "Trees [Discourse]," trans. by Bhikkhu Bodhi (2000), Connected Discourses of the Buddha: A Translation of the Saṃyutta Nikāya (Boston: Wisdom Publications), pp. 1593, 1906 n. 81; and, Sn 2.5 v. 271 or 272 (Fausböll, 1881, p. 46). ^ Magdalena, Fred. "About the Mysterious Balete Tree". BONSAIpinoy (Blog). Archived from the original on 26 October 2009. ^ "Ghost stories: Taotaomona, duendes and other spirits inhabit Guam". Pacific Daily News. Guam. 28 October 2007. ^ a b John R. K. Clark (2001). Hawai'i place names: shores, beaches, and surf sites. University of Hawaii Press. p. 23. ISBN 978-0-8248-2451-8. ^ Friday Frights: The Ghosts Who Haunt Hawai‘i’s Historic ‘Iolani Palace Honolulu Magazine. By Diane Lee. Oct. 6, 2017. Downloaded Sept. 22, 2018. ^ "Attractions of Jagannath Temple, Temples inside Jagannath Temple, Kasi Biswanath Mandira, Koili Baikuntha". ^ "LEGOLAND Florida The Belle of Theme Parks". 20 October 2011. ^ "In the shade of the banyan tree". The Economist. 8 April 2009. ^ "CRASH 4 - Jet Set Willy". Look up banyan in Wiktionary, the free dictionary. Wikimedia Commons has media related to Banyans.